We have a summer recreational water quality sampling program to make sure that popular public swimming areas are safe for recreational use. The sampling is conducted by our Environmental Health Officer once a month from December to March. The results are based on a Microbial standard for primary contact (swimming) as follows. The St Marys Food Risk Management Plan is our action plan for managing township flood risks along St Marys Rivulet. This plan was finalised in February 2019 and implements the findings and priorities from the St Marys Flood Risk Management project which was undertaken following floods that impacted the St Marys community in 2016.
mitigation works (priorities being manage vegetation to improve flows but not impact the stream; a low levee to the north of Groom Street to reduce impact on housing; and modification of The Flat Bridge. 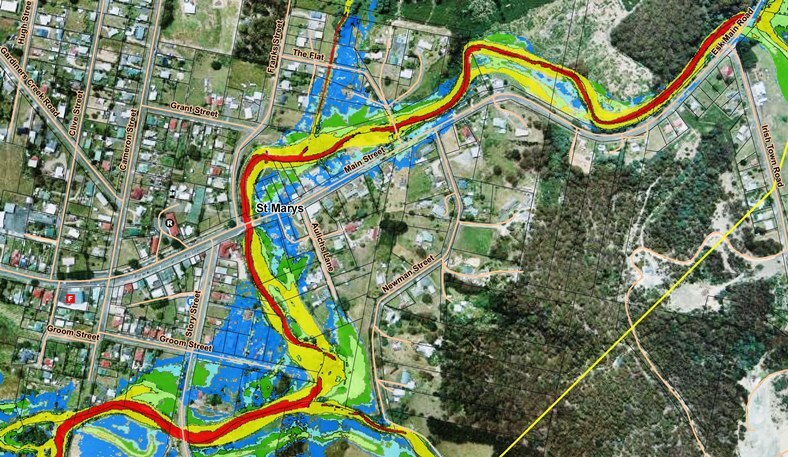 The flood modelling also provides information on what areas are prone to flooding along St Marys Rivulet through the township, which can be used to avoid flood risks for future land use and development. You can view and download the St Marys Food Risk Management Plan here. The community and others such as the SES participated in the St Marys Flood Risk Management project during 2017-2018 to test flood mitigation options with flood models developed from 2016 flood data. Council received funding from the Natural Disaster Resilience Grants Program through the State Emergency Service to undertake this flood modelling and risk management with the St Marys community. As part of the project the community participated in identifying the recommended priorities for mitigation works and other strategies now included in the St Marys Food Risk Management Plan. Flood Risk Management Report, testing mitigation options and recommending flood management strategies. To support flood resilience in the community the reports and information in them is available for the households, businesses, infrastructure managers and emergency management groups and authorities to use for their own flood management responsibilities. The flood maps from the Flood Risk Investigation report can be viewed with an online map viewer here. You can view and download the reports from the links below. The Flood Risk Investigation report is large and its map sets are provided separately. Options for modification of ‘The Flat’ bridge, one of the priorities for flood mitigation work, have undergone further testing with the flood models to identify which one provides the best reduction in flood risk to Main Street residents, businesses and the community. These flood model results are in the memorandum report you can view and download here. Flooding and changes to the floodplain of the Lower George River have been of concern to the community, landowners and Council for many years. In 2006 the Lower George Riverworks Trust was established as a body to manage erosion, sedimentation and flood issues on the lower reaches of the George River near St Helens. Farming and tourism enterprises, public infrastructure and homes are threatened by floods and river changes on the floodplain. Major bank erosion works were undertaken in 2007 and currently the Council is supporting the trust to identify strategies and works which can be undertaken to reduce the risks and impacts.